Do you like watch TV program online? I do, I like turn on my favorite TV program while I use my computer but not TV set. I use some p2p clients to watch different countries TV program, because it is free, if you use cable to watch these TV programs on your regular TV set you have to pay extra money for open these channels. I do not want, they are not my main TV channels, I do not want to pay them every month for only watch it a few times a week. I know we can watch many TV program from internet, my cable fee included internet accessing, why not to use it for watch some foreign TV programs which I am interesting? 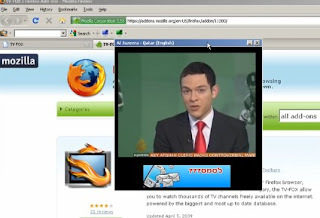 Today, I would like introduce a Firefox add-on that setup a tool bar on your Firefox browser, only one click you can watch different TV programs around the world. Simple go to TV Fox, or direct click here to download an add-on. 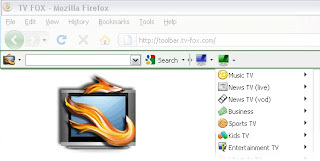 After installed this add-on and restart Firefox browser, you will see a new tool bar appears on your browser, you can find different TV channels there. 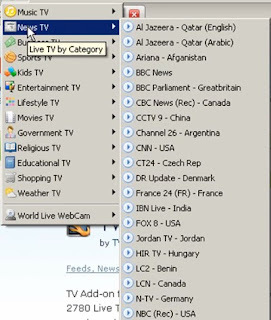 Just one click you can open a window to watch TV program. It has over 2780 Live TV Channels. It is easy to use.